Those in the market for a visually pleasing mid-range compact sports car are currently spoilt for choice. At one end we have the Porsche Boxster and Cayman: two race-ready titans that shirk some of the softer everyday usability for unrivalled performance both on-road and on-track. At the other end of the spectrum we have the Mercedes-Benz SLK and BMW Z4: sophisticated offerings that are more comfortable cruisers than they are B-road bottle rockets. Somewhere in the middle sits the Audi TT - a car that has never quite troubled its sportier rivals in the handling department but has sold by the shedload thanks to its Bauhaus-inspired lines, impressive standard equipment and user-friendliness. An all-new model, which is packed to the rear spoiler with intelligent technology and stylistic swagger, is set to hit UK roads next year and it has high hopes of topping the 60,000 UK sales racked up by its predecessor. A large swathe of the sports car buying public doesn't give two hoots about chassis dynamics and throttle response and Audi knows this. That's why it offers its new TT with attention-grabbing tech, a simple yet impressive engine line-up and an options list that's longer than most Dan Brown novels. Once you've messed around with the Virtual Cockpit, enjoyed the modern interior and swooned at the intelligent LED headlamps, you'll likely overlook the fact that this isn't an all-out thrill machine. Keen tech heads will have likely heard about Audi's Virtual Cockpit - a system that does away with typical analogue dials and binnacles and replaces them with a super sharp LCD screen. Although the system isn't quite as visually impactful as the CES concept upon which it is based, it does work beautifully well. The driver simply scrolls through menus via buttons on the steering wheel or those located in the centre console. These access a number of features on the 12.3-inch high-resolution LCD driver display nestled behind the steering wheel. Thanks to a high-speed Tegra 30 graphics chip, the digital speedometer and rev counter smoothly shrink and expand upon request, while the driver can call up navigation and infotainment options at the press of a button. The neat MMI control panel with MMI Touch, which allows letters to be inputted via a small scratchpad, has also been carried over from the Audi A3. Other notable features include the jet fighter style air conditioning vents with integrated controls and the optional active xenon headlights, which can sense oncoming vehicles or pedestrians and shut off illumination panels. This avoids the dangerous dazzling effects yet ensures as much of the road ahead is brightly illuminated. Two revised engines will be available from launch: a 2.0-litre TFSI developing 227bhp, or a super efficient 2.0-litre TDI Ultra diesel unit that kicks out 182bhp. The more powerful TTS petrol is coming later next year. The petrol is naturally the one to go for if more 'spirited' driving is on the cards; it delivers punchy acceleration, lets out pleasing little pops and bangs on the overrun and can be coupled with the brilliantly sticky quattro all-wheel drive system. However, the diesel offers a seriously impressive 67.3mpg and doesn't feel too much slower than its petrol-powered sibling. Audi's progressive steering technology also ensures the TT feels agile, with the rack designed to become more direct as more lock is fed into the wheel. Add into the mix Dynamic Drive mode, which adjusts steering weighting, throttle response and suspension stiffness when coupled with Audi's Magentic Ride option, and you've got a fairly exciting little sports car. It's definitely not one for the purists but it will be very interesting to see just how good a race-ready TT-RS model could be. Many Audi naysayers will bash the identikit approach the marque takes to much of its line-up but the new TT's interior really is special. The aforementioned Virtual Cockpit and 'all-in-one' air conditioning controls clear most surfaces of buttons, leaving smooth open expanses, while innovations such as a phone storage area that also charges mobile devices via USB de-clutters the cockpit further. Perhaps the only downfall is that front passengers are robbed of a touch-screen to fiddle with. Oh, and there's only enough room in the rear for microscopic children. 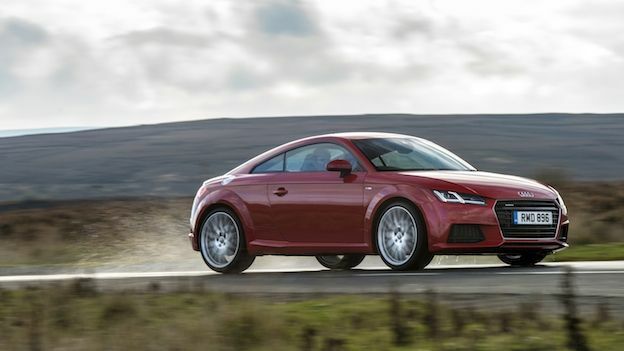 The new Audi TT is likely to prove a smash hit thanks to its stylish looks and intriguing technology. While it won't set pants on fire with its performance, it remains quick enough to raise a smile when the roads get twisty, boasts head-tuning looks and doesn't cost an absolute fortune to run.